Disney Channels EMEA has commissioned an animated series adaptation of classic movie One Hundred and One Dalmations. The news of 101 Dalmation Street came as Disney’s EMEA arm showcased its latest wares at the Annecy Animation Festival in France this week. Both One Hundred and One Dalmations and Dodie Smith’s original 1956 novel were cited as inspirations behind 101 Dalmation Street, which Anttu Harlin and Joonas Utti from Finnish studio Gigglebug Entertainment originally pitched. Disney’s original animation team in London developed the concept with Passion Animation Studios, with Maria O’Loughlin attached to write and Miklos Weigert directing the 48x11mins series. The series, and two 22-minute specials, will roll out on Disney Channel around the world next year. The series takes place in modern London, England, and follows the adventures of the oldest two siblings, Dylan and Dolly, of 99 puppies living with their parents, Doug and Delilah. 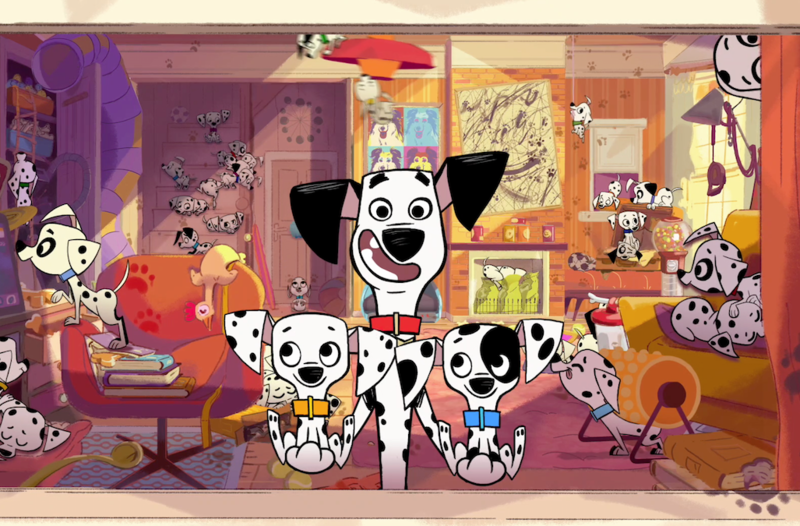 “There’s a big old-fashioned house at number 101 Dalmatian Street where a huge family of 101 dogs live all by themselves, without a human owner, setting up the biggest, messiest and furriest family comedy you could ever imagine,” said Disney head of animation, digital and acquisitions Orion Ross. Disney EMEA has also commissioned Cyber Group Studios-produced toon Gigantosaurus, as previously reported. France Télévisions and Super RTL are also investing in the series, which is set for 2019 and follows four young dinosaur friends in prehistoric times. Another new series is Space Chickens in Space, which comes from Norwegian twins Tommy and Markys Vad Flaaten and creators José C. Garcia and Rita Street. The 52x11mins surrealist comedy (including eleven two-minute shorts) follows a trio of chickens who are mistakenly enrolled in an elite intergalactic military academy. Disney EMEA has co-commissioned it with Nine Network in Australia. Spain’s Anima Estudios, UK-based Cake, Studio Moshi and Gingerbread are coproducing ahead of a 2018 debut. Disney has also recomissioned PJ Masks, Simon, Miraculous: Tales of Ladybug and Cat Noir. The Disney Channels portfolio is available in 117 territories worldwide. Disney Channels EMEA and France senior VP and general manager Hélène Etzi and her team held the Annecy press conference to both celebrate the 20th anniversary of Disney Channel France and re-confirm the Mouse House’s “commitment to backing local animated productions, helping producers develop original programmes and seek out creative partnerships”.